Italy's centre-left opposition party has elected Dario Franceschini as its new leader. He replaces Walter Veltroni, who stood down on Tuesday after his Democratic Party lost a key local election on the island of Sardinia. The result consolidated the hold on power of Italian Prime Minister Silvio Berlusconi's centre-right alliance, after its candidate for governor won. Mr Franceschini is a veteran politician who has two published novels. "Optimism has returned, trust has returned and the will to fight has returned," said Mr Franceschini after his election by party delegates gathered in Rome, Reuters news agency reported. He won 1,047 of 1,258 votes cast, while his only rival - former Defence Minister Arturo Parisi - gained just 92 votes. 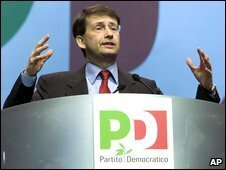 Previously associated with the Christian Democrats, Mr Franceschini joined the Democratic Party when it was set up by Mr Veltroni in 2007 and had been acting as his deputy. Mr Veltroni had been criticised for failing to make gains on the government despite the deepening recession. He led the centre-left into the general election last April after Prime Minister Romano Prodi resigned, but lost to Mr Berlusconi and his allies. He had since failed to make up ground on his rival.